This past July, we took a week long camping trip to Roswell, New Mexico to visit the UFO Museum and Research Center, as well as explore the different state parks in the area (mainly Bottomless Lakes, which sported some amazing sunken caves). As with most of our camping trips, we like to schedule 51% of the day hiking, exploring, playing, and the other 49% just sitting (reading, listening to music, napping). It’s that 49% of the day when our 5 year old typically asks to watch TV or play his DS. So, to combat this, I created a Real Life Roleplaying Game to keep him busy, both on the road and at the campsite. Inside, you’ll find complete details of how I did it, what I included, and even a Google Spreadsheet template to get you started! The challenge came in making it appropriate to his age, while also making it relative to the site-seeing and adventures we’d encounter on the trip. I also tried to stay true to the spirit of an RPG by adding in character leveling, leveled quests, quest rewards, badges, and credits. Because he’s 5 years old, word-based questing was going to be difficult, unless I was willing to deal with him constantly saying, “What’s this word?” After all, the whole point of this was to keep him self-motivated and busy during our downtime. So, to accomplish this, I focused on making as much of the game picture-based. To do this, I created nine categories that every quest would fall under. Each category had a “badge” assigned to it in order to let him know if it was a quest he would complete during the ride, while setting up camp, on a nature hike, while at the UFO Museum, and more. Next came the important part: quests. Now, I’m a big fan of “Kill ___ rats,” or “Collect ___ piles of ___” in RPG’s. I know this is the least favorite part of most RPGer’s, but I love the simplicity of it. There’s a sort of objectivity to it. Either you killed 5 Gungans, or you didn’t! Either you freed 12 blood elf slaves, or you didn’t! So, I aimed to make some of the quests in this vein, especially the ones that could be accomplished on the road. It also made it very easy for my son to understand the goal of the quest. These quests all fell under the “Spotter” badge: the badge that he was trying to earn for having good eyes on the road. For each of those quests he completed, he received 100 credits (more in the next section). If he completed 3 of the 5 quests, he received a reward (in this case a cheap pair of binoculars). Once he completed all 5, he earned the badge. See the final product at the end for a list of all the quests we included in the game. As previously stated, each individual quest earned him credits. Each quest had a level, and depending on how many Level 1 quests he completed, he moved on to Level 2. Then, completing a certain amount of Level 2 quests granted him access to Level 3. Each Level gave him “Level # x 100” credits. So, Level 1 earned him 100 credits per quest completed, Level 2 earned him 200, Level 3 earned him 300, and so on. So, what could he do with the credits? He could buy candy, cookies, or soda (all items he rarely gets at home). He can also buy DVD or video game time (in 30 minute increments) during the day. We typically watch a movie as a family each night (lately it’s been MST3K, which he loves, though 99% of all jokes are over his head), so it’s a very special opportunity for him to be able to “purchase” an episode of Scooby Doo to watch a 1 o’clock in the afternoon. Rewards were handed out based on how many quests he completed for a given badge. After completing 3 quests in a badge category, he earned the equivalent reward. Complete 3 “Spotter” badge quests? Earn binoculars. Complete 3 “Helper” badge quests? Earn a flashlight. Complete 3 “UFO Hunter” badge quests? 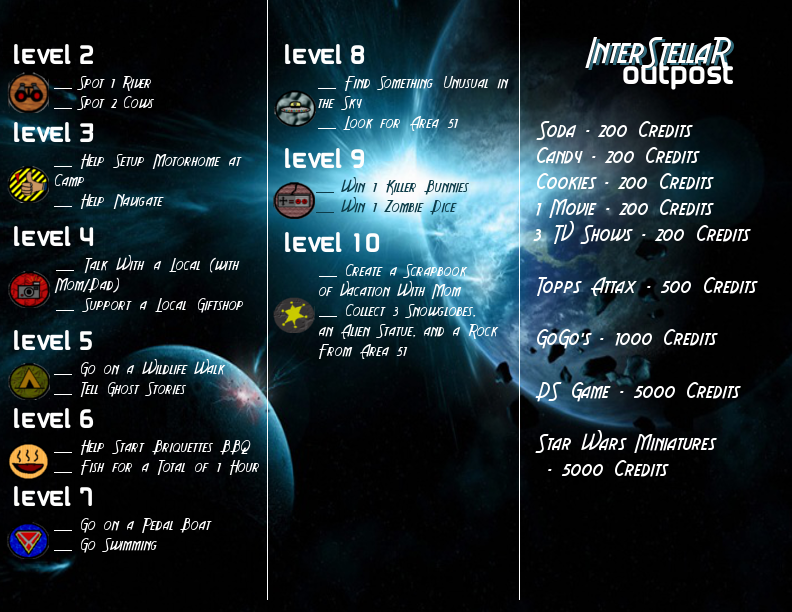 Earn a UFO Tracker (green laser pointer). I picked up most of the “rewards” at the $.99 Stores or Big Lots, so as not to spend too much money. The goal of this game wasn’t to make him flush with “things,” but to keep him focused on the important aspects of the trip. So, they were little things that went a long way. The flashlight was a cheap, $.99 LED light. The green laser pointer I scored on a Deal-of-the-Day site for $3. The binoculars were a pair we had been taking to Dodgers games for years, and needed to be upgraded. All together, I spent roughly $50 on the entire collection of “rewards,” with the bulk of the cost leaning towards the Lego board game (Magikus as reviewed last month) and the special fishing pole he had been eying for a couple of years. Again, I can’t make the point enough: the goal is not to gift your child with toys and stuff. The goal is to attach a relative, meaningful monetary reward that was connected to the exploration and adventure of the trip. Before I could put it all together to present to my son the day we left, I needed to make sure that I had everything organized. I needed to make sure that the levels for each quest were balanced (i.e. Level 1 quests involved things he would see on the way there, whereas Level 8 quests would involve actions he could complete towards the end of the trip), the rewards were aligned correctly (i.e. he didn’t earn something earth-shattering the first day, and then had no desire to finish the rest of the quests), and that the credit cost of items were relative to what he could earn (i.e. soda shouldn’t cost the same as a pack of baseball cards). To do this, I created a spreadsheet to track the quests, their rewards, what badges they were aligned with, and how many credits he could earn. 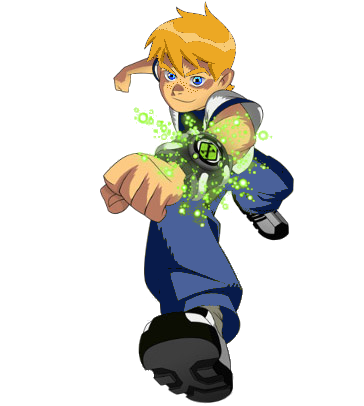 After borrowing the character design from Ben 10 (and making modifications to mold it into a facsimile of my son), spending a few hours in GIMP, and having my son review the badge icons to see if he could guess what they mean (as a trial run of him being able to suss out the meanings), I was ready to present it. Below are 2 shots of the final product, a front and back view of what ended up being a laminated 8.5″ x 11″ pamphlet for him to use. NOTE: It’s a good idea to make THREE copies, as nine days on the road with a 5 year old can lead to spilling, ripping, or losing of the pamphlet. 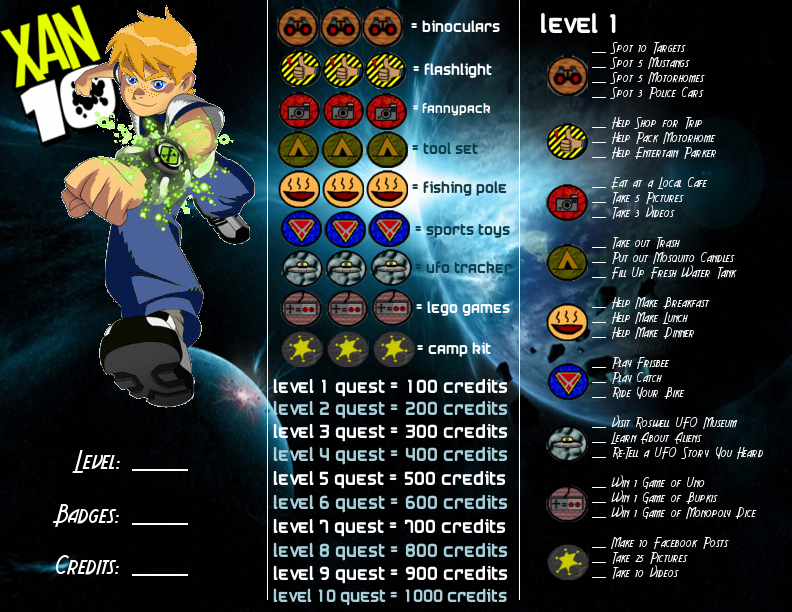 As you can see, quests were organized based on their relative “badges.” There were spaces on the front to keep track of his Level and how many credits he earned. The last column on the back page was the “InterStellar Outpost” where he could examine what items were available for purchase. We went with a space theme, as it was related to the trip we were taking (to the Roswell UFO Museum). No matter what theme you go with, what quests you create, or what rewards you allow, keep in mind that this is meant to be fun for your child — and, maybe to indoctrinate them into the RPG universe, so you can have a live-in questing buddy for your favorite MMO or D&D. Feel free to use the Google Template and any other ideas from this post. Have a question? Ask me via Twitter or Comments below.